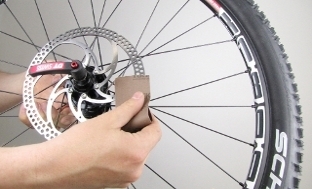 Squeaking and scraping noises is not an unusual phenomenon on disc brakes and especially with new bikes. 1. If you have ridden fewer than 300 kms on your bike, the brakes are not yet fully “ridden in“. In this case it is very probable that the noises will go away themselves. 2. A common cause for squeaking disc brakes are dirty discs. 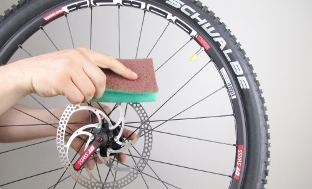 In order to clean these, take the wheels out and clean the discs thoroughly with water or a special cleaner from a good cycle shop. Picture 1 Oily discs need very careful cleaning, however oily brake pads can’t be cleaned and must be replaced. 3. Scraping or grinding noises occur if the brake discs are not correctly centered between the brake pads. Another common cause is not having the wheel correctly centered in the frame. In order to remedy this, position the bike on a flat surface. 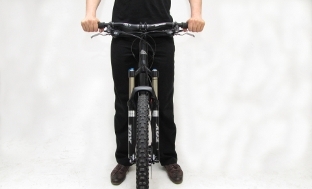 Slacken off the quick release and lift the bike slightly off the floor without the wheels. Then press down on the handlebars until the drop outs fully engage on the front and rear wheels. Picture 2 Then completely retighten the quick releases. Tip: The quick release levers should point to the rear when they are fitted otherwise it’s easier for twigs to get lodged between the quick release lever and the frame. 4. Roughen the cleaned brake discs with rough emery paper. Picture 3 Warning Be extra careful when doing any work on the brake disc since the disc edges are extremely sharp! 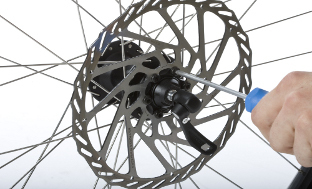 It is not uncommon for disc brakes on a new bike to make scraping noises, especially when cornering, when riding out of the saddle or when it Is under extreme loads. Loud squeaking noises can also occur under such circumstances. This does not automatically mean that the brake is badly adjusted. A new brake disc also needs to be “ridden in“. If the brake only occasionally slightly scrapes, it is often better to simply accept these noises. Sometimes the clearance between the brake pads and disc is so minute that it is unavoidable that the pads scrape slightly against the disc. Especially when the bike is fitted with very thin discs, it can sometimes occur that the disc omits clicking noises. New brake pads and discs always need to be “ridden in” when they are brand new. Braking allows the pads and disc to get used to each other. This can take up to 300 kms of riding so during these first 300 kms you refrain from hard braking. Also avoid braking continuously on long descents and brake gently wherever possible. The levers of the quick releases sould always point backwards. If not, the lever can catch branches. Clean the brake discs thoroughly and completely remove any grease or oil on the brake components. The edge of the discs are very sharp. Take extra care not to cut your fingers! If brake fluid leaks out or if the brakes or the hose is damaged, cease using your bicycle immediately.